I am a through and through garlic fanatic How many cloves should I use? Why not all of them! Is there enough garlic? Is there ever enough! Do we need more? Yes, always yes! And if in doubt...just use more! My friend and I made a giant pesto, garlic bread loaf it must have been last year? Obviously when she asked if we needed more garlic my response was yes and due to impatience and hunger we got the loaf out while the garlic was still raw unbeknown to us so we ended up eating raw garlic bread and ill be honest I didn't hate it. I actually kind of liked the itchy mouth it gave me, like itchy mouth cheese, do you know what I'm talking about? cheese that's so strong it makes your mouth itch, it makes me want to ferociously chew food but it's surprisingly not an annoyance. Although I enjoyed it, she's kind of sworn off eating anything with garlic in it with me because she can taste it in her mouth days after. 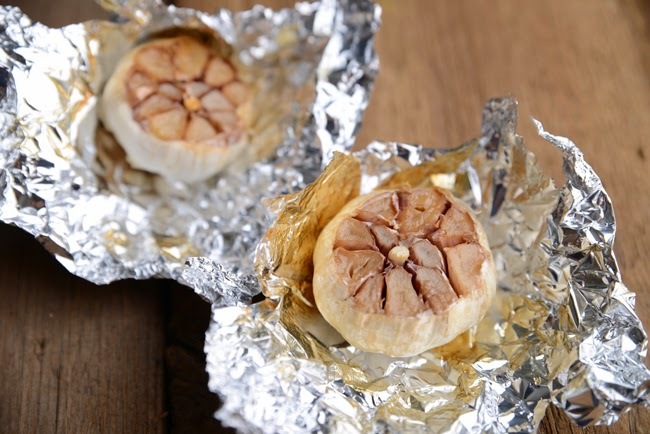 Anyway about a year ago someone sent me a link to roasted garlic, obviously it is more than perfect for me roasted, check, garlic CHECK what else do you need other than a napkin for the aftermath. I finally, finally got round to making it and ohh boy! I would say if you have a cold this is 100% the best thing to eat. People say garlic is good to fight off a cold but what they don't tell you is how to chock it down; this you could eat by the bulb. I will stand by the notion that Garlic is good for you, then everything else is just a blur to me because that's more than enough for me to harbour pre-baked garlic bread around the house in case of a global catastrophe or a power cut - the power actually tripped while I was writing this post but from me walking downstairs to flick it back on there wasn't quite enough time for me to go into a panic frenzy about the existential existence of garlic bread. This recipe is so simple, you'll be kicking yourself that you haven't made this before now and it makes the garlic taste buttery and sweet. If you're someone who doesn't like being able to taste the garlic hours after you've eaten it this is perfect for you and you can use it in recipes like my sun dried tomato and roasted garlic houmous and roasted garlic flat bread. Cut the top of the bulb off so that all of the cloves are exposed, drizzle a teaspoon of olive oil on the top of each bulb. 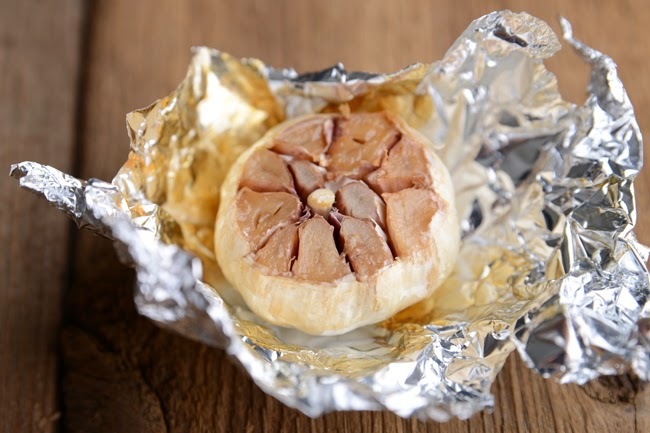 Wrap the bulb in foil and place in the oven. Bake for 50 minutes - 1 hour until soft and squidgy.